Dine Around the World in Downtown Cranford: July 17-26! Think Global, Dine Local. That’s the theme of our “Dine Around the World” event, taking place from July 17-26. Over 20 restaurants will be participating with promotions, special menus, and discounts. Diners can pick up their passports at participating restaurants (one passport per family, while supplies last). Every time you dine in at a participating restaurant for dinner you’ll receive a stamp. Drop your stamped passport in the “Dine Around the World” mailbox in Eastman Plaza by July 29 for a chance to win a downtown gift certificate. 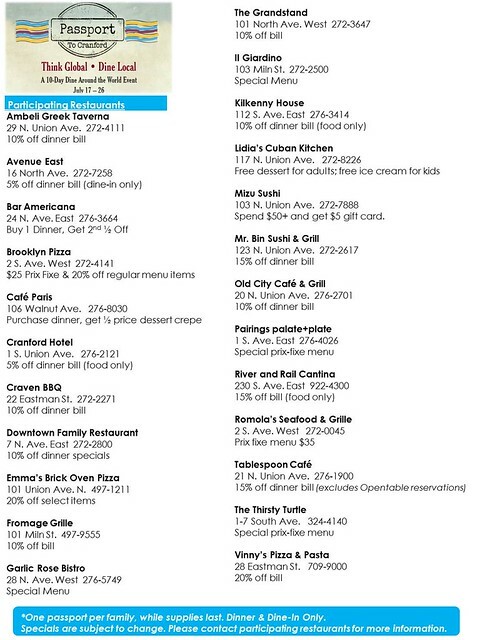 So start planning out your 10 days of dining now. This is the perfect time to revisit an old favorite or dine at a restaurant you haven’t tried yet. We’re so proud of the fact that our downtown can offer so many downtown dining options – there truly is something for everyone! Our Dine Around the World event is a great opportunity to spotlight not only the diversity of downtown dining options, but also our other retailers as well. 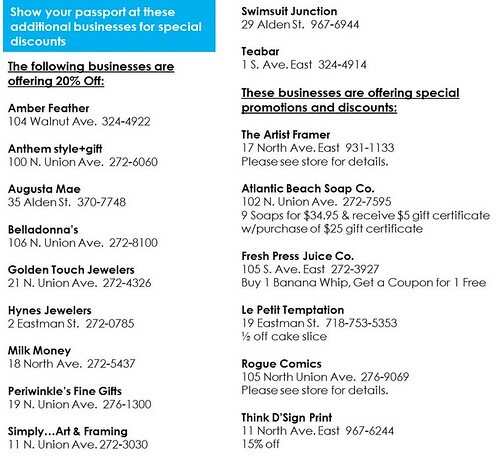 That’s why we’re so excited to announce that if you show your passport at participating downtown businesses you’ll receive a special discount. In addition, this Friday and Saturday many businesses will be holding Sidewalk Sales and there will be FREE PARKING throughout downtown. There are just so many excellent reasons to come downtown!